In 2004, a partnership between the City of Brookings, Brookings County, state representatives, Brookings Economic Development Corporation, South Dakota State University, South Dakota State University Foundation and several private sector interests came together with the common goal of propelling knowledge-based economic development in eastern South Dakota. With that goal in mind, the SDSU Growth Partnership was formed and their primary focus was the creation of a research park in Brookings: the Research Park at South Dakota State University, formerly known as South Dakota State University Innovation Campus. ​​At ​the end of 2006, construction development began on the first research park in the state of South Dakota – the Research Park at South Dakota State University. 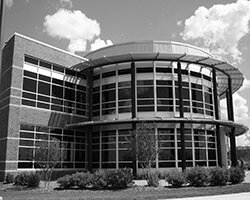 ​The first building in the park, Brookings Innovation Center, was completed in October 2008 and contained 27,000 square feet. It is a multi-tenant building that serves as the park’s headquarters and as an incubator for new start-up companies and entrepreneurs. The Brookings Innovation Center also provides spaces and services for well-established companies who serve as mentors and business partners to the start-up companies. By April of 2009, construction began on the second building in the research park, the Seed Technology Laboratory. This lab is used to conduct research and develop, enhance and coordinate discovery, teaching, extension/outreach, and technical services in seed and crop science, technology and biotechnology, as well as breeding for South Dakota State University. By 2009, the infrastructure (roads, curbs, gutters, sidewalks, and utilities) for the entire 125 acres of the park was completed paving the way for more growth and opportunities. ​In less than eight years, the Research Park at South Dakota State University quickly grew from a small idea to a realized dream. The Research Park strives to establish itself as a physical environment that can develop, attract and retain technology companies that are aligned to the talent and sponsored research conducted at SDSU.